During the middle of last season, I started a weekly series devoted to non-conference games. Way back then, the 2014 West was on track for the highest winning percentage against the East over the last 18 years. They eventually fell just short of that mark, but recorded the highest point-differential against the East and vice versa. Those stats since 1997 are according to NBA.com, but there were still 46 years of non-conference matchups to uncover. Which conference in which year really had the highest winning percentage against the other? What about point differential? That’s what this post takes care of. Below is a table allowing for sorting and filtering over the last 60+ years. 1951 to 1996 were from Basketball-Reference. After that I’ll look at the best years in winning percentage and point differential. From 1951 to 1970, the conferences were called divisions and for good reason: There were as few as eight teams. 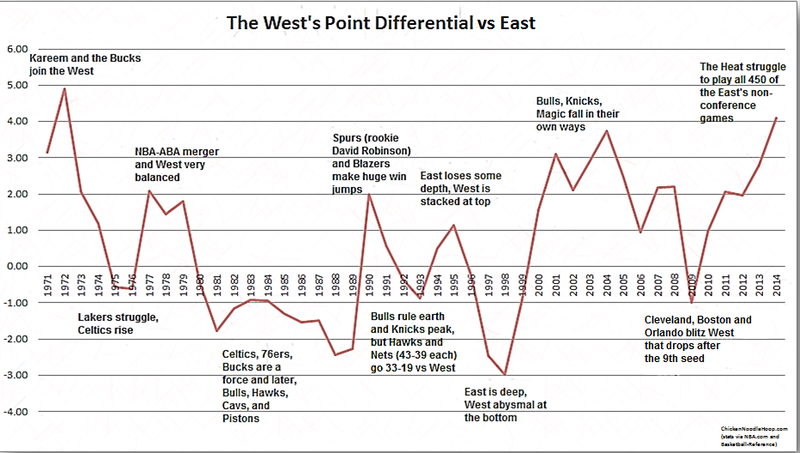 The East was often the best over those 20 years of non-conference battles, and their peak was 1960. The Syracuse Nationals and Philadelphia Warriors improved by 10+ wins, the latter team with a rookie Wilt Chamberlain, but there was also the 59-16 Boston Celtics with Bill Russell. Out West, the St. Louis Hawks were the only team to finish over .500, 46-29, while the other three were a combined 74-151. The 1960 East still have the highest winning percentage ever in non-conference play at 70.83, 7.5 percent better than the 2004 West’s mark of 63.33, but they also own the highest point differential of +5.87, about a full point higher than the second-highest that came from the 1972 West. More on those runner-ups in a bit. From 1951 to 1970, though, it seems fair to put an asterisk next to that era’s non-conference stats because of how small the NBA was. For that reason and visual purposes, I left them out of some charts. 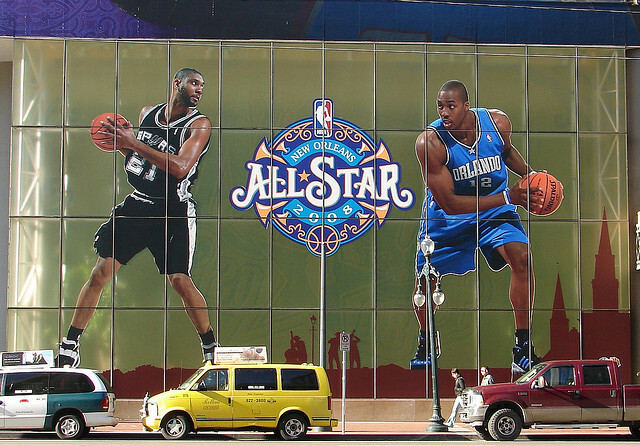 As for 2004, the East was mostly a two-team race between the eventual champion Detroit Pistons and the conference finalist Indiana Pacers. In the West, the Lakers may have been the favorite, but there were arguably four other teams that, with a little luck, could’ve made the Finals instead. 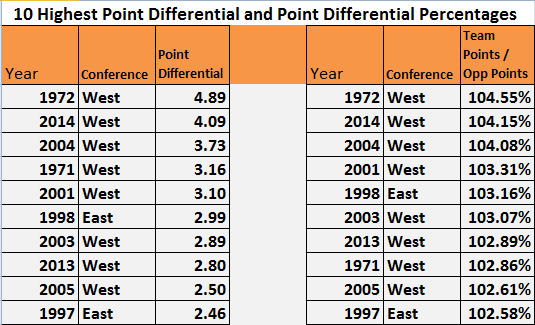 For the highest point differential, the 1972 West outdoes 2014 by a decent amount. Among other reasons for the West’s success 42 years ago, Kareem Abdul-Jabbar and the defending champion Milwaukee Bucks were in their second season placed in the conference. Six of their nine teams recorded over 47 wins that year while the East had just two of their eight do the same in Boston and New York. ‘PD%’ doesn’t change too much of the top 10. It does lower the separation between the 1972 and 2014 West while some recent, slow-paced years with a dominant conference move up the ranks, but the charts over the last 40 years look pretty identical. They both indicate East was better during the ’80s and, when some guy named Michael Jordan wasn’t in retirement, the ’90s also. Since then, the East has struggled for a variety of reasons, one being sloppy roster management. That looks to have changed somewhat, and sooner or later some of the West’s powerhouses will rebuild while the East will crank out more consistent winners. We’ll see how much LeBron James, Carmelo Anthony, and Chris Bosh all staying in the East helped the conference in both the short and long run.